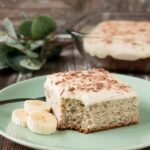 This decadent banana cake is supremely moist and loaded with banana flavor. It’s easy to make and topped with a sweet-tangy cream cheese frosting. Preheat oven to 350F and grease a 9×13″ baking dish. In a medium bowl, toss together the flour, baking soda and salt. Set aside. Using a stand mixer with paddle attachment or electric mixer, cream together the sugar and butter until combined. Mix in the sour cream, then eggs, one at a time, mixing in between. Mix in the mashed bananas and vanilla extract. Then slowly stir in the flour mixture until just combined. Spoon the batter into the prepared baking pan. Bake for 35-40 minutes or until the center comes out clean. Let cool completely before frosting. Using a stand mixer with paddle attachment or electric mixer, beat the butter and cream cheese until combined. Mix in the powdered sugar one cup at a time, scraping the bottom of the bowl occasionally. Then mix in the vanilla and salt until smooth. Spread on cake, and top with chopped walnuts, chocolate shavings or banana slices (just before serving) if desired. Cream the butter and sugar together until it looks like wet sand for an even mix. If you are using a stand mixer, make sure you scrape the bottom of the bowl at every step, so you don’t end up with an unevenly mixed batter. If you are using an electric mixer to stir in the flour, add it in two parts, so you don’t get flour everywhere. If you are stirring it in by hand, then go ahead and add it in all at once. Sift your powdered sugar for a creamy-smooth frosting. Again, if you are using a stand mixer, make sure you scrape the bottom of the bowl periodically. Leftovers can be covered up and stored in the fridge for 3-5 days.